The City to Sea Bridge in Wellington CBD, on the North Island of New Zealand, is all lit up at night so that this pedestrian bridge and area for public artwork can clearly be seen by all who pass by. This bridge literally links the city to the sea. The City to Sea Bridge in Wellington CBD on the North Island of New Zealand has become a tourist attraction in its own right and people come here not purely to walk across this pedestrain bridge but to also see the artwork that adorns the side of the bridge. This is a very pretty area of Wellington, the capital city of New Zealand, and this bridge literally connects the CBD of Wellington to the waterfront and it's accesible 24 hours a day for anyone to walk across. It was opened in 1994 and it crosses Jervois Quay. It is also an interesting shape as it is in a wedge shape and the artwork that adorns the bridge also actually forms part of the side of the bridge as well. 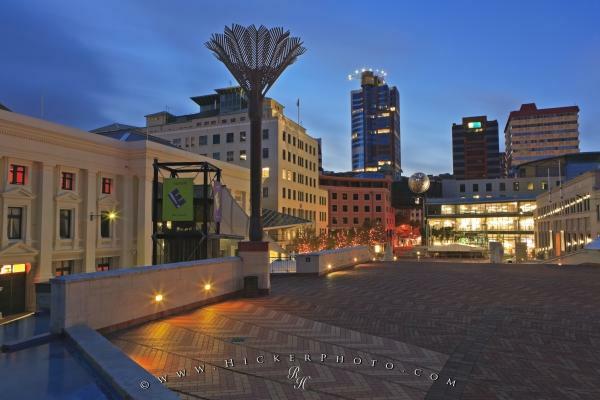 Photo of the City to Sea Bridge in the Wellington CBD, Wellington City, New Zealand. ... The art is based on the connection of the city to the sea and is constantly changing, so each visit to the bridge with some time in between will afford the visitor a new perspective of this connection. It is hard to see from this viewpoint, the artwork of the bridge as this view looks across the bridgedeck to the city center but the palm tree sculpture that can be seen on the left of the center is part of the art, and there is more treasures like that just waiting to be discovered. City to Sea Bridge, Wellington CBD, Wellington, North Island, New Zealand. I photographed this photo with the digital SLR camera model Canon EOS-1Ds Mark II, aperture of f/16.0, exposure time of 1/0.04 sec. on ISO 50, as always I used a original Canon Lens, the focus lenght for this picture was 24mm.